For most of my work life, I relied on Microsoft Windows and loved it eternally. Right from the days of Win 3.1 where the whole OS would come in a set of eight 3.5 inch floppy disks to Windows for Workgroups, then Win 95, Win ME (anyone remembers it) and so on. My first laptop was a Toshiba (it was the cheapest I could afford and I bought it in MN, USA in 2001) running Win ME or Windows Millennium. For 2 years when I worked at EMC, it was all Sun Solaris and Linux before I again came back to Windows in 2002 when I joined Adobe. I loved all the short-cuts, how one can do almost everything using a keyboard and what not. I was growing super comfortable with MS and was using MS Win7 when it dawned on me that it is time to get out of comfort zone. In 2010 odd, I decided to give Win a go and moved to a Macbook. To make the transition real, I let go of all Windows machines so there was no way I could fall back on a windows box. It was damn tough in the beginning. Apple was on OS X by then so it was much much better than in past but Windows was still Windows. You could do any thing on Windows. On Mac, you didn’t know the plumbing much so it was very hard to tweak things in registry, difficult to remove program and all their files and what not. Even today there is no option in ‘Control Panel’ equivalent of Mac to do ‘Add/Remove Program’. If you want to remove something then go to ‘Programs’ folder and just delete. It is so simple. Over time, I started loving my Macbook and its been 3 years since then. I am a convert now. Meanwhile MS came out with Win8 (and recently Win 8.1) and I have zero experience of working on them. I do plan to grab a MS Surface for a couple of months to at least see whats cooking there. I also moved to Apple Phone early this year and with an Apple tab at home, it sort of completes the loop. My wife also uses Apple Macbook and the only hard thing we have is when we have to teach our daughter computer lessons, it is difficult for her to relate to what she saw in her school computer lab. Enough of Apple talk, the intention behind writing this is to share about the company behind these products and that is ‘Apple Inc’. Over last 5 years they have made this huge transition from another cutting edge company to a cult design company. iPod was successful but iPhone was a riot, to not stop there, iPad almost started a new stream of computing devices. Just like phone, Apple were not the first in Tabs area but after iPad, everyone began to take note of this new form factor and now there are tabs all around. Apple got so much success in its products that it could begin to drive (and decide) the deviations from certain well-established and well-respsected standards. Where it is Micro SIM (iPhone 4) or a Nano SIM (iPhone 5) , lightning port (instead of Ethernet/VGA) or to not give any USB outlet for its devices. MacBooks do not come with DVD drives or an ethernet port. The charging port of new iPhone is different so all the millions of accessories people created (charging docks, radio docks blabla) for iPhone 4 and before now needs an upgrade. Not only this, Apple decided to play hard for its ‘App Store’ and there has been numerous stories on how the certification process is not transparent and blabla. And of course everyone remembers about Flash Player and Apple Devices. All of the above ensured that their customers get a controlled and high quality experience. No longer I need to blame an App maker for a crash on my iPhone because I know that if it is a bad quality it won’t even get a place in ‘Apple App Store’. Apple raked so much money and the only direction they could now go was to go down. Unfortunately Steve Jobs, iconic leader of Apple, left in Oct 2011. Apple released the newer iPhone, an iPad-Mini (which Steve publicly never accepted as a right form factor) and the business went on as usual but the trend started to reverse. The acceleration was lower and the earnings (as well as profit) began to slide. For last 3 quarters, the slide continued. They got beaten on the stock market and so on. A lot of people have already begin to see them disappearing over next few years but here comes a surprise. 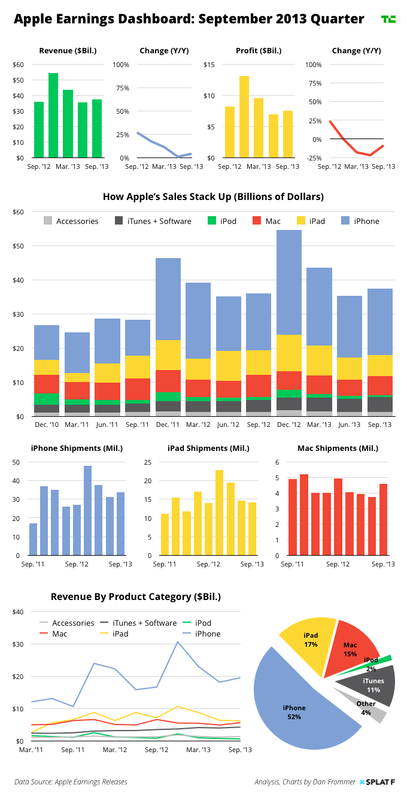 In last quarter, Apple’s numbers sort of moved a bit up. Here’s a brilliant info-graphic I sourced from Techcrunch early today. When I read about above today, I thought that I would write a short note on my experience with Apple devices. It has been great and I often wonder that I should have moved to Apple sooner. I am still not a Apple fanatic and I am up for a change when the time comes. My unsolicited advice to you is that you are too comfortable with Windows, then take a good break and move to a iOS device. It would be hard initially and that would do good for your ageing brain cells, challenge yourself and trust me, after the initially pangs are over, you would love the change. I am also now beginning to think of moving to something else. May be a MS Surface ? What do you guys think ?